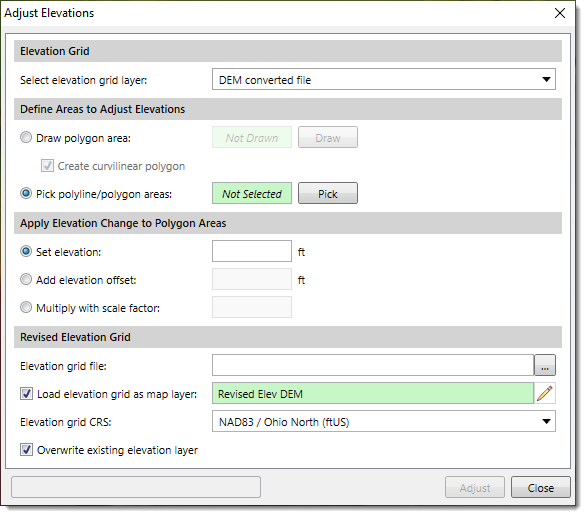 The Adjust Elevations command is used to set or adjust elevations for a portion of an existing elevation grid. The user can interactively draw (or select) polygons on the Map View and then define the corresponding elevation value, which can then be merged with the source elevation grid in order to create a revised elevation grid. 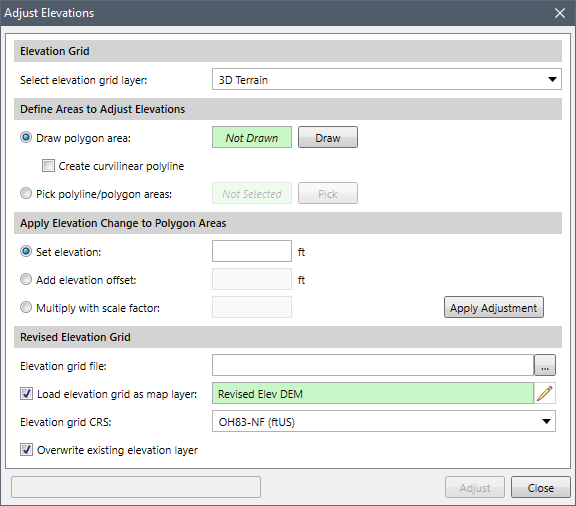 In addition, this command allows the user to specify the coordinate reference system (CRS) and grid resolution of the final revised elevation grid. The command facilitates creating a more accurate representation of a model’s geometry, for example setting a lake or reservoir bottom elevation. From the Map Edit ribbon menu, select the Adjust Elevations command. The Adjust Elevations dialog box will be displayed. The following sections describe the Adjust Elevations command and how to interact with the above dialog box. This section allows the user to select the elevation grid layer that is to be revised. From the Select elevation grid layer dropdown combo box, select the source elevation grid. The dropdown combo box will list all the elevation layers that are currently used in the project. This section allows the user to define the portions of the existing elevation grid where the elevation value needs to be adjusted. The user can directly draw a polygon on the Map View or select existing polylines or closed polygons from the Map View to define the areas where elevation values will be adjusted. When ready to draw a polygon on the Map View, click the [Draw] button. Use the Create curvilinear polygon checkbox option to make a smooth curvilinear boundary for the drawn polygon. The Adjust Elevations dialog box will temporarily disappear, and a prompt will be displayed on the status line informing the user what to do next. Draw a polygon on the Map View, and then right-click and choose Done from the displayed context menu. The Adjust Elevations dialog box will redisplay. Alternatively, click the [Pick] button and then select polygons or closed polylines from the Map View. Then, right-click and select Done from the displayed context menu. The Adjust Elevations dialog box will redisplay. Set elevation: this option defines a specific elevation for the selected region. Add elevation offset: this option raises or lowers the elevation of the selected region by the specified value. Multiply with scale factor: this option modifies the elevation by multiplying it by the defined scaling factor. This section is used to define the specifications of the revised elevation grid. Click the […] browse button for the Elevation grid file entry to specify the file name and directory location to save the revised elevation grid file. By default, the Load elevation grid as map layer checkbox option is checked to load the revised elevation grid as a layer in the Map Data Layers panel. Click the pencil icon to rename the layer. The user can select the CRS to be used for the revised elevation grid. By default, the software uses the project CRS. The Overwrite existing elevation layer checkbox option is checked by default to automatically overwrite an existing elevation layer (if one exists) with the revised elevation grid layer. After the elevation grid options have been defined, click the [Adjust] button and the software will generate the revised elevation grid file and optionally load the DEM file as a layer in the Map Data Layers panel.